A few weeks ago I mentioned that I had received my license for Zumba Toning. As this is a new Zumba format to Nova Scotia (the training I went to was the first held in the Atlantic provinces – anyone who held the license prior to that had travelled elsewhere to obtain it), and is still quite new in general, I thought a “What’s what” post on Zumba toning was in order. What makes Zumba Toning different? In a nut shell, the main difference between a regular Zumba class and a Zumba Toning class is the addition and focus on strength training exercises within the dances, as well as the addition of toning sticks. This type of class will not give you the aerobic workout you know and expect from regular Zumba classes, but instead works on circuit training (a few minutes of cardio followed by a few minutes of strength training) which creates a higher calorie burn than strength training alone, offers some cardiovascular exercise and because it is still Zumba – it’s FUN! You are able to use light hand weights instead of the toning sticks in a Zumba toning class, but because hand weights are hard metal (as apposed to the flowing sand that is inside the toning sticks) you won’t be able to do all of the moves and truly the fun factor goes down a few degrees. The toning sticks aren’t expensive, so they are totally worth it (IMO) for the fun factor alone. If you do go the hand weight route, you should never go above a 3lb weight (more on that in a minute). Will it make me bulk up? The truth is there are very few women who “bulk up” easily. To gain a pound of muscle takes an incredible amount of work and heavy weight training. The bottom line is, the weight amounts used in a Zumba Toning class are much too low to create muscle mass. The name “Zumba Toning” says it all, this class is meant to create a toned look – not a bulky look, and isn’t that what most women are looking for? The appearance of toned muscles especially in the arms, legs and core? 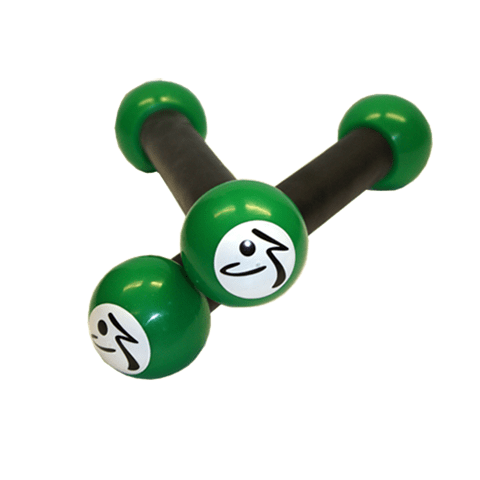 In addition to the toning effects, it also helps to improve your posture, balance, coordination, agility, bone density, joint mobility – and lots more. Is this workout for me? As with any type of workout, Zumba Toning is not for everyone. If you have any known medical or physical conditions you should consult your physician before undertaking any new or different exercise program. He or she knows you situation best and can advise you whether a Zumba Toning class is appropriate for you. Assuming you are a healthy and injury-free individual, who loves going to Zumba – does that mean Zumba Toning will be a good fit for you? Not necessarily. Zumba toning requires a whole new level of coordination and mind/body connection. If you are interested in attending a Zumba Toning class you first step should be asking your regular Zumba instructor if he/she thinks you are ready to try Zumba Toning. Certainly that doesn’t mean you absolutely need their approval before attending a class, or that you have to be a Zumba regular before taking up Zumba Toning but both are a good idea. Another option is Zumba Toning without the toning sticks. If your instructor feels you may not be quite ready to add the toning sticks to the workout they may suggest you attend the class and participate weight-free. You’re still going to get a great workout, and they are doing it for your own safety, not to single you out. The addition of weights (even light weights) requires you pay close attention to your range of motion, working in a controlled environment to avoid injury. You may find that your instructor asks all new participants to take the class without the sticks the first time so that they can observe you in action to make sure you won’t injure yourself when you do add the weights. The last thing I want talk about is your instructor. Many people don’t realize this but to become a Zumba instructor you do not need to be a health or fitness professional. Anyone can walk in off the street and take the 8 hour workshop and leave a licensed Zumba instructor. While that is concerning enough for regular Zumba classes, in order to become a licensed Zumba Toning instructor, the only pre-requisite is that you are a licensed Zumba instructor. So that means on a Saturday you could technically take the Zumba licensing workshop, and then turnaround and take the Zumba Toning workshop on Sunday and by Monday morning be licensed to teach both classes. This is scary because that means you have had very, very, very limited anatomy training, no real testing to ensure you are capable of teaching a safe and effective class, and in fact – no testing at all. Please, please, please, make sure your Zumba Toning instructor is a certified fitness professional. Find out if your instructor is a Personal Trainer, Fitness Instructor, Dance teacher, etc. If their only credential is that they took the training workshops think twice about taking their class. I’m not for a second saying that there aren’t insanely awesome instructors that can dance and teach circles around me. I’m saying that there are undoubtedly instructors out there that don’t really know what they are doing. That are teaching unsafe movements at unsafe speeds in their Zumba toning classes. If they are serious about their profession they will take the time to become a professional. If they aren’t willing to take the time and effort to become certified – do you want to put your body literally in their hands? At my training workshop there were 30-35 Zumba instructors there, and only 6 of us were certified instructors or personal trainers. There was actually one person at the end of the day who asked how they could find out about upper body exercises because the only ones they know are a bicep curl, the shoulder press and shoulder raise. This was at th end of the day, 5 minutes before they were given their license to teach a weighed exercise class. Be wary. Ask your instructor what their credentials are – if they are a professional they won’t mind you asking. If they aren’t – well, wouldn’t you like to know before you put your body in jeopardy? If you are interested in Zumba Toning but can’t find a class near you I have some dance toning videos on my youtube channel that will give you an idea of what it’s like. So there you have it! A little insight to one of the new*er* fitness classes out there. What do you think? Is Zumba toning something you would like to try? Is there another type of class or workout you are interested in learning more about?